When his mom, Holly, buys a run down trailer that reeks like smelly gym socks and parks it at the dirty and crowded Diamond Beach, eleven year-old, Marcus discovers a hidden staircase leading to a cellar. Though he would rather be playing video games, he is drawn through magical cellar doors and finds a world which leads to a dream vacation for those who enter. Edison, the son of Holly's childhood friend, Coco, becomes the first trapped in his perfect holiday, a thrilling amusement park. When Edison's teenage sister gets stuck in her dream, a celebrity laden rock club, Marcus must enlist the help of grown ups in a frenetic race to save his new friends. Each dream vacation turns downright hostile to anybody who tries to leave. Like a roller coaster with dizzying twists and turns, the two families find the operator of their dreams during their struggle to escape. That operator, the sweet former owner of their trailer, Miss Molpe, is really a child-eating siren from Greek mythology. The story takes a an unpredictable twist when Miss Molpe turns dream vacations into nightmare trips that never seem to end. 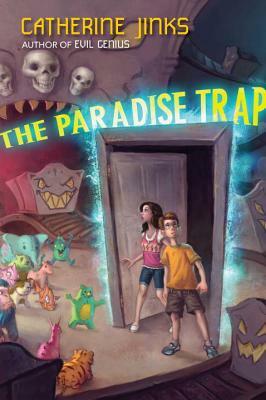 Plenty of horror laced with humor and satire make THE PARADISE TRAP the perfect summer vacation read. Catharine Jinks brilliantly plots an imaginative fantasy that will have the reader laughing one minute while holding back a frightened breath the next. Recommended for ages 11-13 for those who love thrills and fantasy. With never a dull moment, The Paradise Trap is bound to be a summer favorite. **I received this book at no charge from the publisher to facilitate my review. No monetary compensation was received and I was not asked to give a positive review in exchange for a free book.